In Western culture, masks are used to disguise, distort, deceive. 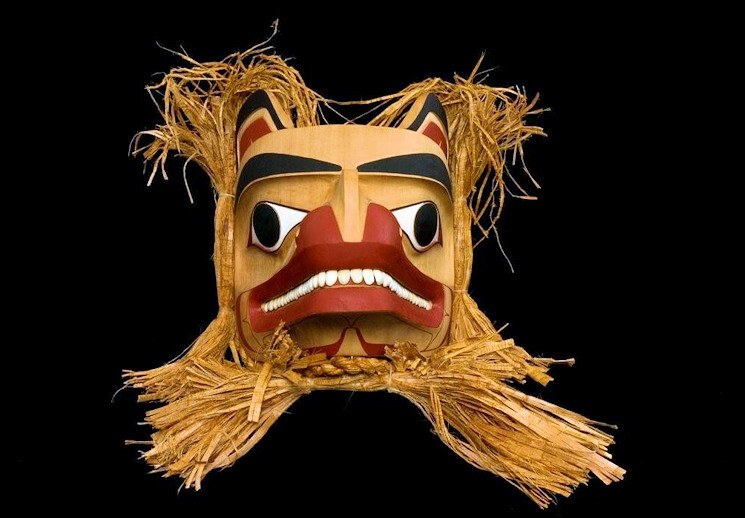 The First Peoples of the Northwest Coast of BC, however, use masks as a means of communication — and have done so for centuries. In the largest collection of First Nations masks ever amassed, The Vancouver Art Gallery is currently hosting Down from the Shimmering Sky : Masks of the Northwest. 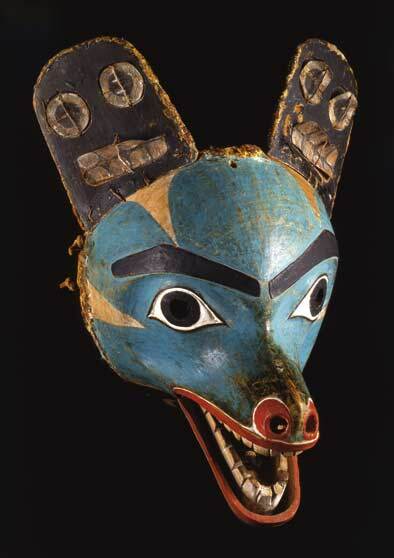 Some of the exhibit’s 175 masks are new, but most come from 57 private and institutional collections in Canada, the US and Europe, and are returning to Canada for the first time in 200 years. Yuppies, incidentally, were not the first avid collectors of aboriginal art — some of these masks were collected during Captain Cook’s early expeditions. Those from the late 18th century and early 19th century are of human faces; it was only after the 1850s that masks depicting animals and supernatural creatures became predominant. 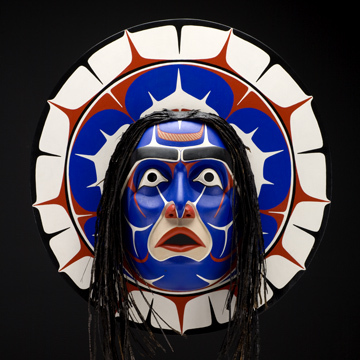 In the 1870s, Haida artists such as Simeon Stilthda and John Gwaythil began creating masks specifically for sale. 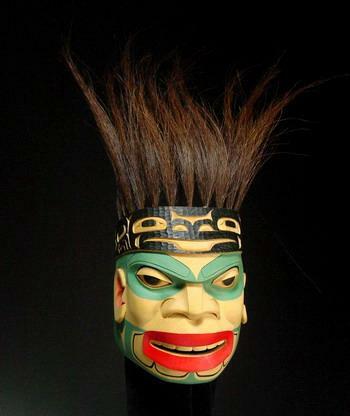 Today, there is a strong community of mask-makers in BC, and there is more interest in producing non-traditional masks that draw inspiration from the secular world. Down from the Shimmering Sky includes masks from the Nuxalk, Haida, Kwakwaka’wakw, Heiltsuk, Tlingit, Nuu-chah-nulth, Gitxsan, Nisga’a and Makah nations. While the identities of those who carved the older masks remain unknown, there are pieces by Robert Davidson, Charles Edenshaw, Richard Hunt, Willie Seaweed, Arthur Thompson, Mungo Martin, Tony Hunt, Joe David, Tim Paul and Freda Diesing. The exhibit, which runs to October, explores the representation of The Human Face Divine, plus the four dimensions of the cosmos as perceived by the various nations. The Sky World, which dominates legend and life, is depicted with radiant sun masks, serene moon masks or supernatural bird masks — of the thunderbird, crooked-beak, raven or eagle. The Mortal World, the realm occupied by real and mythic creatures, is represented by wolf, grizzly bear, sea lion or puffin masks. The Killer Whale is a common representation of the Undersea World, which is equal in mystery and power to that of the sky and is full of threatening creatures; and the Spirit World, which co-exists with the Mortal World but is home to a fearsome ghost who is the keeper of drowned souls, is depicted by masks of strong emotion. Some are decorative pieces, some ceremonial objects. Some are ugly, some pretty, some fierce, some gentle. All are powerful icons; each one tells a story and reminds its people of their responsibility to carry on the traditions and values of their ancestors.